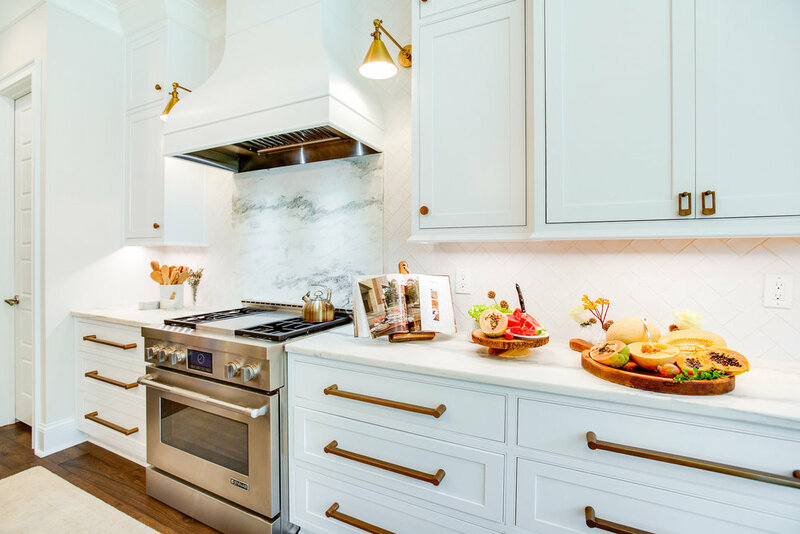 This new homes kitchen design has a neutral palette with a classic color scheme. 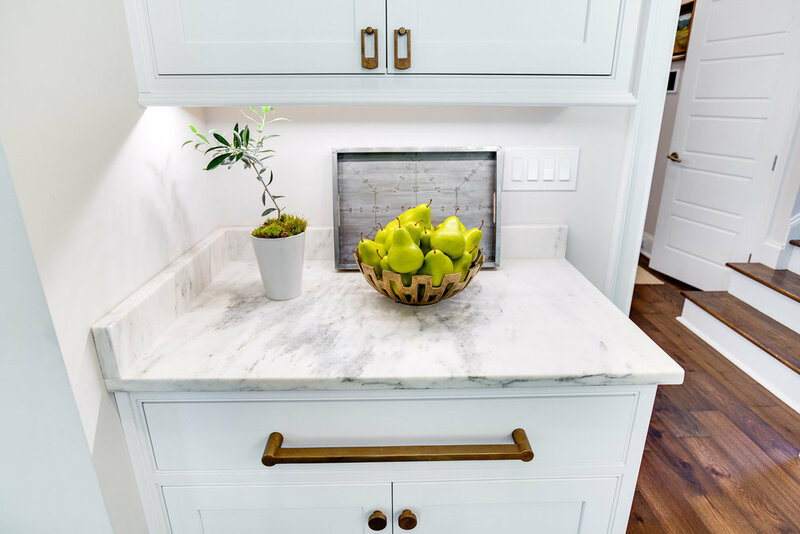 The Montclair Danby Margaux marble countertops and inset cabinet doors add a timeless feel and the contrasting warm-toned lighting fixtures and cabinet hardware brings a modern element to this beautiful home. Expansive windows and thoughtfully placed task lighting bask the kitchen in light for a bright and spacious ambience. This expansive kitchen was designed to accommodate large family gatherings and yet conveys a sense of intimacy through the use of multiple separate spaces. The oversized kitchen island has seating for five and positioned to be as functional as it is elegant. An interesting design feature was employed on the kitchen island countertop. Two three centimeter slabs of marble were laminated together to create a more substantial cascade edge profile. 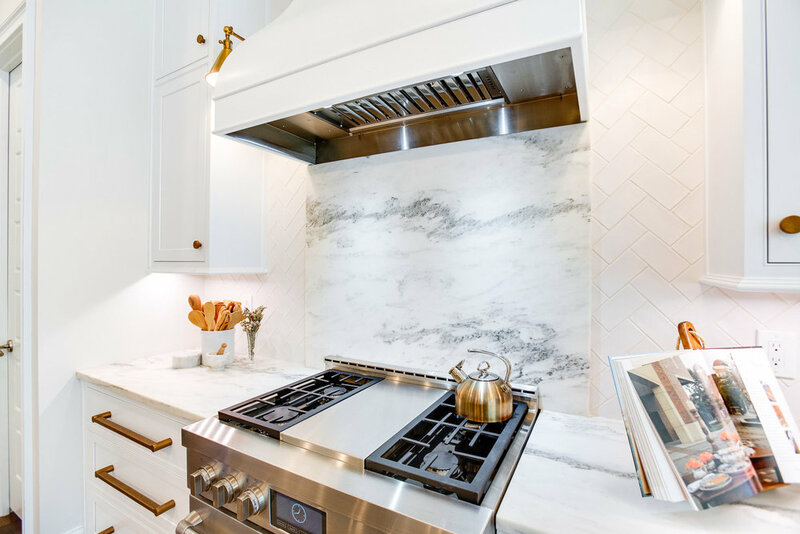 A slab of the same Montclair Danby marble was paired with herringbone subway tile to create the range backsplash. The Adex subway tile has a mat crackle finish. That's why we work closely with Central Alabama's foremost vendors and count on them to provide the highest-quality materials available. Some of the elements in this kitchen include, Hallmark Flooring's Novella Collection engineered hardwood in Elliot, Ashley Norton cabinet hardware, Visual Comfort wall sconces , Jenn-Air Professional Appliances, Shiloh Cabinetry, Sierra Pacific windows, and chandeliers by Gabby Lighting. A breakfast area with room for six has floor to ceiling windows by Sierra Pacific and an egress to the back porch. Cook book shelving is strategically placed between the Jenn-Air refrigerator and the walk-in pantry closet. The pantry contains adjustable shelving and baskets for storage. This butlers pantry with wet bar ingeniously doubles as the hallway into the dining room as well as a serving area for entertaining and family gatherings. It contains ample counter space, under cabinet lighting by Task, a Jenn-Air Professional dishwasher and beverage center as well as a stainless steel bar sink for easy clean up.